The weather in Britain over the last few weeks has seemed to consist almost entirely of storms and gales, punctuated briefly by days like today – calm, bright and cold. Further north and in the high areas further south they’ve also been treated to snow and some poor people have been without electricity since before Christmas. The power companies have been working their socks off trying to repair storm damage, but as soon as it’s repaired another storm hits! We have been more fortunate and, to be honest, we are so used to power cuts here (caused either by bad weather or geese flying into power lines) that we also have a back up generator which is large enough to power the house, providing we have enough fuel! I’m in that lull between festivities when all I want to do is tear the house down and rebuild it. We’ve come close, laying a carpet on Christmas Eve (no kidding) and today hubbie mowed the lawn. Yes, in December. It was a job waiting to be done and neither of us have had time to do it. This is what our lives are sometimes like. We are perpetually short on time. And used to it. So used to it that yesterday, in the middle of a raging storm, I decided to go for a trail run and hubbie decided to mountain bike alongside. I’m not sure if I got his company because he wanted to be with me or because he was feared that a tree would be blown down and his chef would be squashed. In any case I was glad of the companionship. I intended to run 3 miles, the furthest I can run through these woods. Regardless of rain, wind, mud and anything else nature was hurling at me I was going to run 3 miles. Murphy Dog was a little less ambitious and seemed to want to settle for just one mile and a cosy bed by the fire, but 3 miles it was going to be! When we set off it was windy. About a third of a mile in we turn a corner, out of the cover of the trees, out onto a longish straight. The wind tends to funnel along this straight, held captive by the trees on either side. As we turned the corner we realised just how strong that wind was. My pace slowed right down, my effort per inch raised and I was going nowhere fast! Whether it was that I’d escaped the house after a few days of incarceration or that the wind was making me hysterical, that didn’t matter, I was running with a smile. Or maybe that was G-force. The run back was a bit easier. The wind was on my back, flipping my pony tail over my shoulder and pushing my homeward. There are more uphills on the home journey, but they seemed less relevant. I had a jet pack propelling me onwards. If only I always had one! I did my 3 miles in 34 minutes which was a good trail 3 miles for me regardless of the weather. 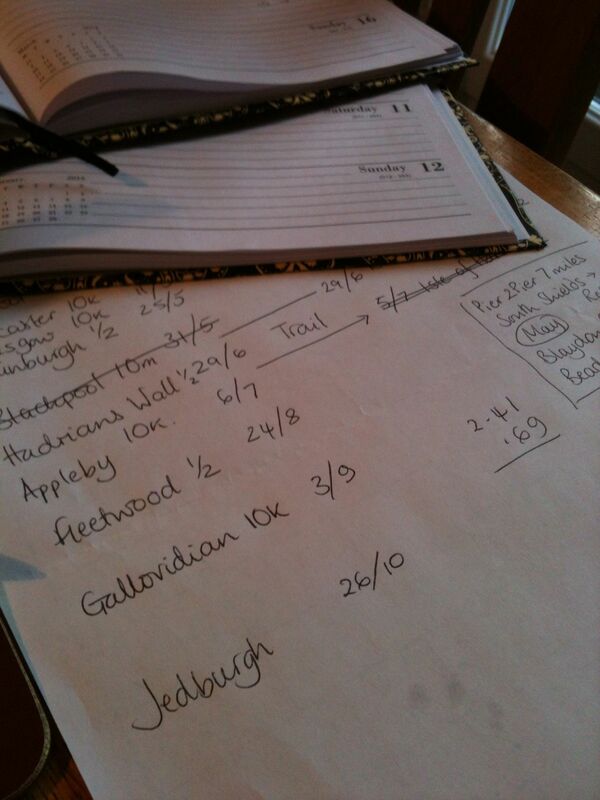 I’m now sitting with three diaries (home, school and gallery) and three websites (http://northernrunningguide.com , http://scottishrunningguide.com and http://www.runnersworld.co.uk ) planning my 2014 Race Calendar. It’s a complicated thing which I hope to simplify into races I can afford, can maybe make a weekend of and want to do. I have my regulars (Gallovidian 10k and Jedburgh 10k) and new regulars (Great Cumbrian Run and Cross Border Challenge) which are tried, tested and approved, but the others are more of a mystery at the moment. As soon as I know you’ll know too. This new year I am not setting challenges. All I want is to have as injury free a year as I can. I hope to do that and improve on my PBs, but if running free of pain is all I can achieve that’ll do me fine! 2014 will be the year of joyous running. Yes it will. First of all I’d like to say thank you to everyone who has been checking up on my progress and maladies since I last posted. Knowing that people whom I have never met care enough to reach out is very comforting. I’m back running, albeit on the treadmill as our days are light for just six hours now and I’m working all of them. As Christmas hurtles towards us I’m also struggling to find time to run for any decent distance so instead I’ve reverted to my running pattern for this time of year – a run streak. I have to point out, that’s not me, that’s Will Farrell. My rules for my run streak are simple. I run every day. It doesn’t matter where I run, but I allow myself a minimum of fifteen minutes. That’s it. Run every day for at least fifteen minutes. Of course with warm up and cool down time it looks more like half an hour, but that’s the beauty of making fifteen minutes the minimum. I can find half an hour a day, but I can’t always RUN for half an hour a day. Sad as that sounds. Today I got up early and woke my neighbours up by pounding out my minimum on the treadmill in the cabin at the end of the garden. Apparently I can be heard for miles, although I think they might be taking the mickey. 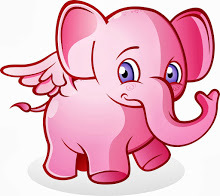 Or maybe my childhood nickname of Fairy Elephant might be more appropriate than I realised. I did a quick 2.6km in 15 minutes, giving me a respectable 9:15 min/mile pace. Go me. My Daily Mile stats tell me that I’ve run 568 miles this year. I would have liked to have got a nice round 600 by New Year, but if I don’t I won’t be overly upset since I’ve had Plantar Fasciitis for half of it! Talking of which, it’s still not properly gone away. I get heel ache after running and walking and standing. Nothing like as bad as it was and I do massage and ice it and, if it’s bad, I wear my night splint. All of this helps, but nothing has cured it completely. 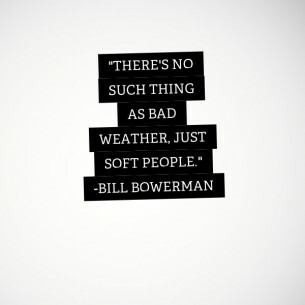 It is bearable though and I shouldn’t complain. 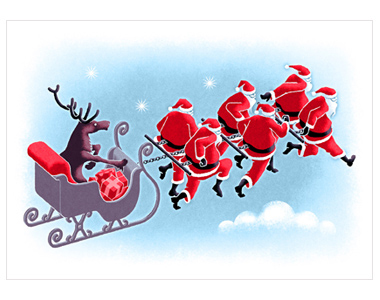 So all that leaves me to do is to wish everyone reading a very Merry Christmas! You can keep up with my run streak on Daily Mile or Twitter, just follow the links on the right of the screen.